I’m slowly learning that making my own summer drinks is way more fun than buying store bought, and it’s easier than you’d ever think! During the summer my family can party a lot, though I’m not talking boozy party family. What I’m trying to say is that we have a great mix of friends with kids around the same age so summer playdates, barbecues and block parties go together like…cherries and basil. We all know how much fun it can be to bring out the cocktail shaker at a party, and making virgin versions can be just as tasty. 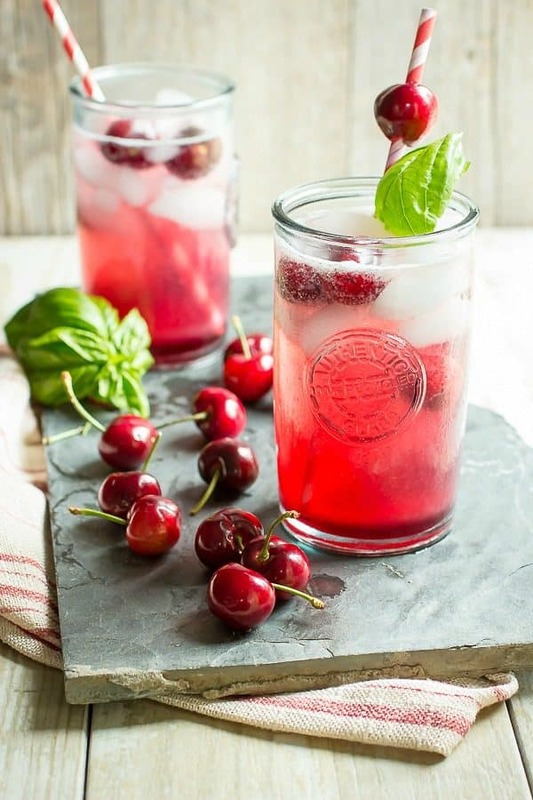 On a side note, I totally won’t scold you for adding Tequila to this Cherry Basil Soda…do it!! Four ingredients is all it takes to come up with this bubbly drink. First you make a cherry syrup by boiling the fresh cherries with some sugar and water. Pass it through a sieve and dump the pulp. Let it cool and lastly mix some of the cherry syrup with ice, a tiny basil leaf and a splash of fizzy water, add a funny straw and mission accomplished. Even with the sugar added to the cherries, this is far from a sweet tasting drink. You can taste the basil and all you need is a very small leaf about the size of your thumbnail. I’m assuming every grown up has similar sized thumb nails? If basil isn’t your thing, just leave it out and roll with the awesome cherry syrup on it’s own. This recipe will easily make two 16 ounce glasses or 4 Starbucks tall size, if you need to fill a giant pitcher that’s going to involve some math but totally doable! If you do make a large batch make sure to stir it every so often to swirl that crazy good cherry syrup back through the drink. Make your own drinks this summer and watch this space because I feel like there’s lots more to come! 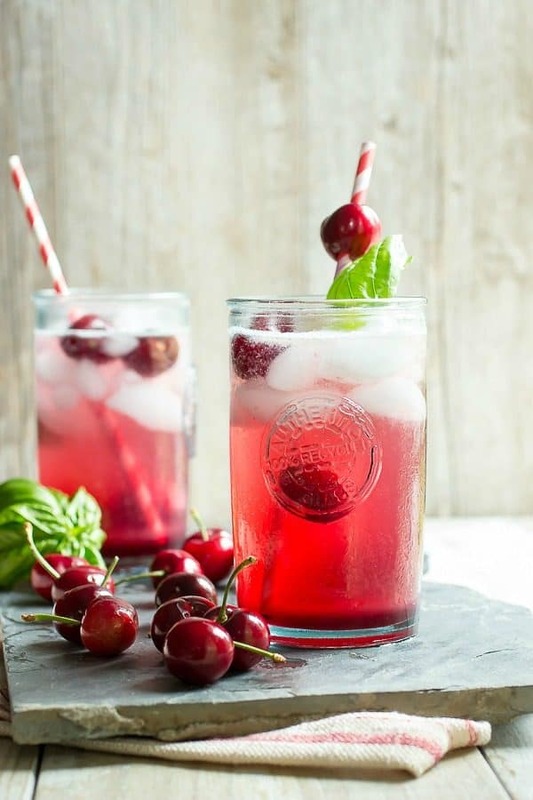 More awesome cherry drinks for summer! 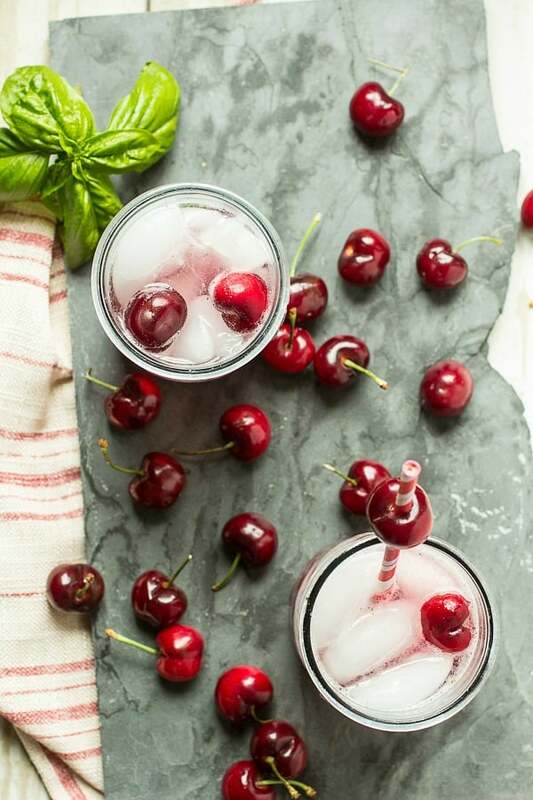 A refreshing summer drink made with fresh cherries, basil and sparkling water. Add the cherries, sugar and water to a small pan and bring to a boil. Turn down the heat to low and simmer the cherries for about 5-7 minutes and they start to become soft enough to be crushed with a fork. Turn of the heat and pass the cooked cherries through a sieve into a small bowl, squeezing out the cherry syrup. You should have almost 3/4 cup of syrup. Discard the leftover pulp and place the bowl of syrup into the freezer for 5 minutes to cool. Once cool line up 4 small glasses and pour 4 tablespoons of cherry syrup into the bottom of each glass. Add 1 small basil leaf to each glass and gently muddle with the back of a wooden spoon. Add ice and fill each glass to the top with sparkling water. I have totally been meaning to make more of my own summer drinks, and then you did all the hard work for me! ;) I am loving the idea of cherries with basil together…I’ve never had it before, but it sounds SO FRESH. Pinning! 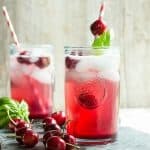 I am all about the summer drinks…and this cherry basil lemonade couldn’t be any more perfect for my love of cherries! And not to mention the cherries in my fridge currently begging to be made into something delicious! PERFECT!!!!! Just yesterday I was asking myself what was a drink I could make that was tasty and fun—-something to drink on my deck after work that wasn’t 5 million calories. This is IT!!! Thank you. This looks as beautiful as it sounds delicious! LOVE this flavor combo, so unique! I love summer drinks. They are very fun. I love the cherries with basil together!! Great and smart idea. Pinned! Oh my! This is so refreshing! And yeah, it’s really much better to make your own drinks than to buy one. It’s more satisfying. I love this soda!